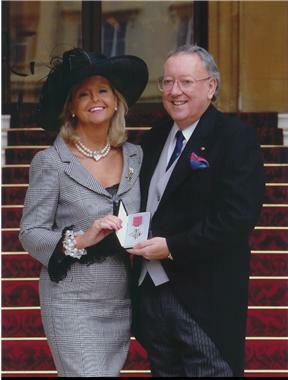 Bob and his partner Laura with his MBE. Bob was born in Dulwich in South London where he lived for the first 21 years of his life. After that he lived variously in Bromley, Orpington and West Wickham, all in the Kent suburbs of Greater London. In 1993 he realised a lifelong ambition when he moved into an oast house on the Kent/Sussex borders south of Tunbridge Wells. He lives with his partner Laura Collins. They met 21 years ago in Florida through the cricketing charity the Lord’s Taverners and were finally married in theSpring of 2012. Bob was playing for the team and Laura had paid to go on the trip. “I notice she hasn’t paid for one since,” says Bob. Both are active in the charity. Laura is a former national Chairman of the Lady Taverners while Bob is a Member of the Board of Trustees. Laura has spent a lifetime in show business having graduated from the famous drama school Italia Conti. Her biggest claim to fame is to have danced in the later stages of Pan’s People under the direction of Flick Colby, one of the “Famous Five” of the group. Bob’s hobbies revolve around sport. Football is his first love and he enjoys and follows the game at all levels. Cricket is a close second and in 2013 he became only the second entertainer to become President of a County Cricket Club at Kent. The other was Sir Richard Stilgoe at Surrey in 2012. He collects football literature and has a massive programme collection right from the very first game he saw in 1955 up to the last game he watched – probably last Saturday. He played some 500 games for Old Wilsonians FC and also had a year with West Wickham in the Southern Amateur League. He actually went in goal in his late 20s and played in every other position for the club although mainly in midfield or up front. He once scored six goals in an 8-2 win over Unilever and hat-trick from the left-wing two weeks later. He played Kent League Tennis for the OWs second team and 1st XI cricket in the North Kent League. In later years he played for Outwood in the Kent Village League and in the East Sussex League. Since he left school has raised hundreds of thousands of pounds for sports clubs and charities for which he was awarded his MBE in 2004. He is also the only after-dinner speaker to be selected for Who’s Who. Outside of sport he enjoys documentaries on TV not least cooking programmes. Both he and Laura enjoying travelling and eating out. I have a golf handicap of 27, but have often been mistaken for a 28.